If You're Going to Say "Cheese!" in Cheshire, Make Sure It's a Big Cheese! Submitted for your continued wandering enjoyment through the Western Berkshires, the next curiosity or roadside attraction that you should make you sure you seek out is a lot easier to find than Balance Rock which I wrote about in my last post as it's right across from the small post office building on Church Street in Cheshire near the Appalachian Trail Message Center kiosk pictured above. Both the Appalachian Trail and the Ashuwillticook Rail Trail pass right through rural Cheshire which was incorporated in 1793 and was the only Berkshire town which favored Thomas Jefferson over then-President and Massachusetts' native John Adams in the election of 1800. It was, in fact, the result of that election and what transpired afterward that inspired the building of the Cheshire Cheese Press that you'll easily find on the corners of Church Street and School Street just like distracted sidekick Paula did below! 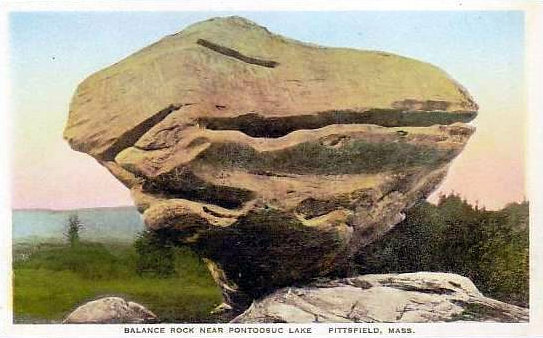 Head to the Western Berkshires Where Tourists Have Been Seeking Balance Since the 1800s! One of the great things about being a distracted wanderer is that I have a great excuse to wander off of the beaten path from time to time and seek out places that may qualify as being a bit "odd" or perhaps a "curiosity" as they aren't places that a lot of people make a point to traveling to however, they make wonderful "side dishes" to whatever your "main entrée" attraction may be if you've got the time to add them to your own wanderings. In this post, I'm going to tell you about one of those "side dishes" that you can find in the Berkshires of Western Massachusetts that you can visit in a short amount of time without putting too big of a dent into whatever your main itinerary is and then be back on the road to wherever else you may be wandering to before you can say, "Well I'm glad we stopped there, that was pretty cool!" Nothin' Could Be Finer Than Stoppin' at the Miss Portland Diner! One of the things that I've learned during my wanderings is that when I see a sign that simply declares one word like "Eat" or "Diner" in big neon letters, there's a darned good chance that the eating establishment nearby is going to be serving up good, simple food like mom used to make at reasonable prices. Such is the case with the neon "Diner" sign above as beneath it you'll find one of the best reasons to wander up to Portland, Maine!